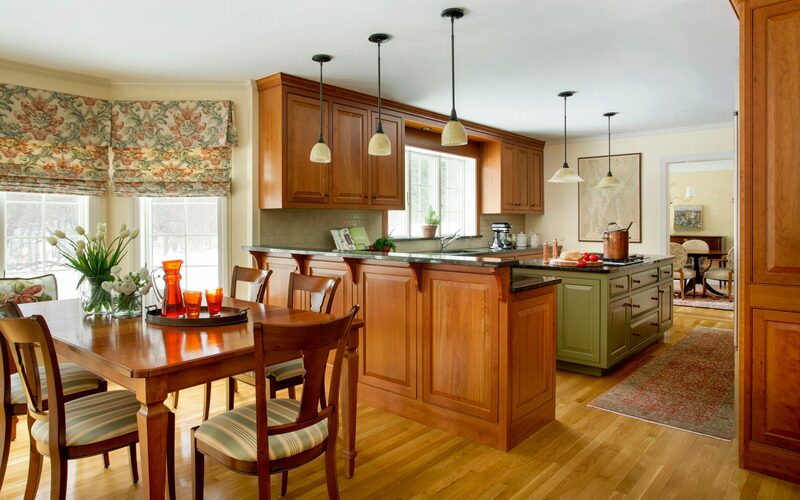 When a professional Boston couple approached Elizabeth Swartz Interiors for a kitchen and bath renovation, we were able to provide them with much more than they had envisioned. By re-organizing under-utilized spaces, we added square footage and functionality. In addition to our interior renovations we collaborated with the builder, detailing a new exterior façade. Our designs transformed both the interior and exterior into a modern home that held true to its traditional colonial architecture. According to a study by Houzz in 2017, the kitchen is the most popular room of a home to renovate. 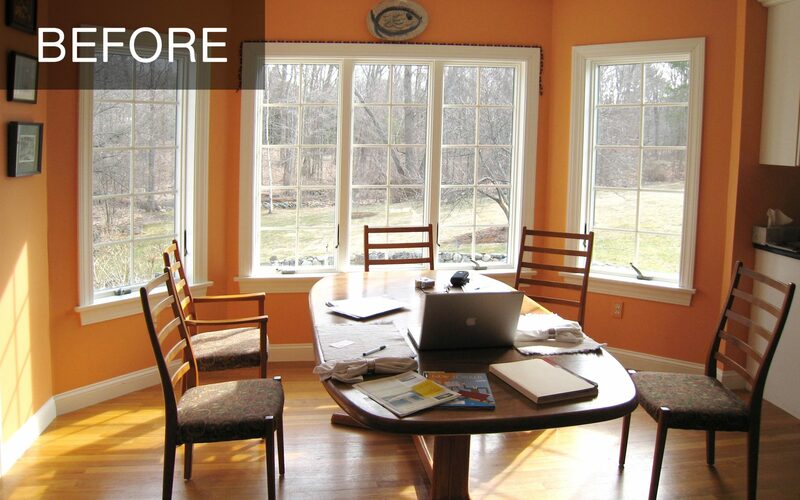 Homeowners renovate for a multitude of reasons. Including spaces that function poorly, outdated appliances or cabinetry, or simply to update the style. All of these reasons were the case for this client. Elizabeth Swartz Interiors first worked closely with the couple to determine how they function in their kitchen. 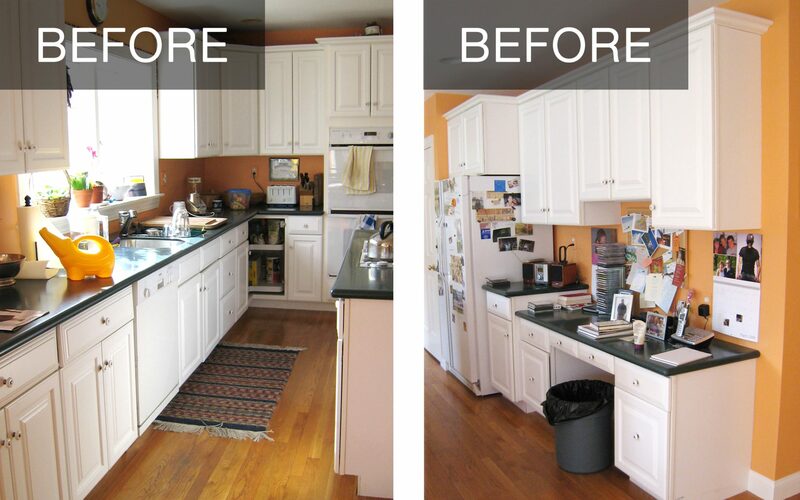 For the kitchen renovation we detailed a new space plan to define the large open space. This plan reconfigured three walls of cabinetry, relocated the appliances, redesigned the island cook-top, and added a peninsula. The kitchen has large windows that flood the space with natural sunlight. But the outdated cabinetry left it feeling stark and impersonal. The homeowners wanted an inviting new kitchen that reflected their love of nature. Working closely with the builder, we tore down white factory cabinets and replaced them with a natural custom cherry cabinet. The medium toned wood absorbs the sunlight, dramatically transforming the kitchen into a warm and inviting space that reflects the private outdoor surroundings. 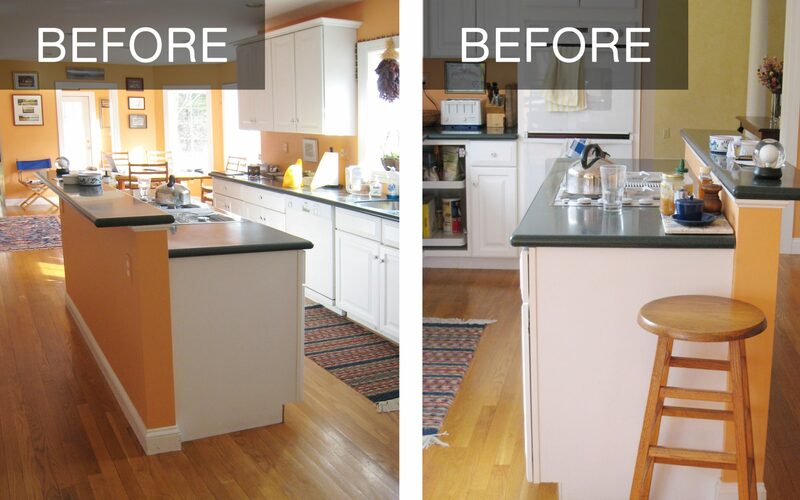 Before the kitchen renovation the island functioned poorly. It had an unusable narrow bar top on the outer edge and no task lighting. Also the stove and sink could not be used at the same time because of their back-to-back locations. We re-designed the island to create an inspiring and functional center cook-top for this couple that loves to work together in the kitchen. 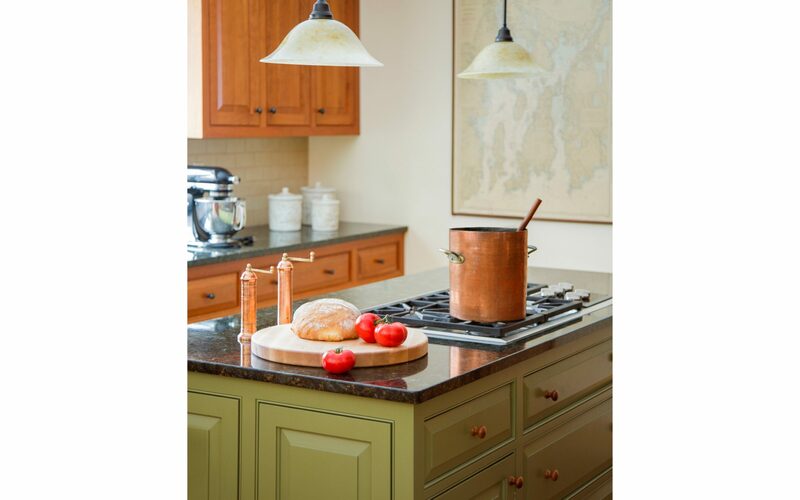 We chose to contrast the warm natural cherry cabinets with a painted green island that coordinated with the subtle green veins of the granite countertop. In addition, soft glass pendants by Hubbarton Forge created the right amount of task lighting above the new kitchen island. 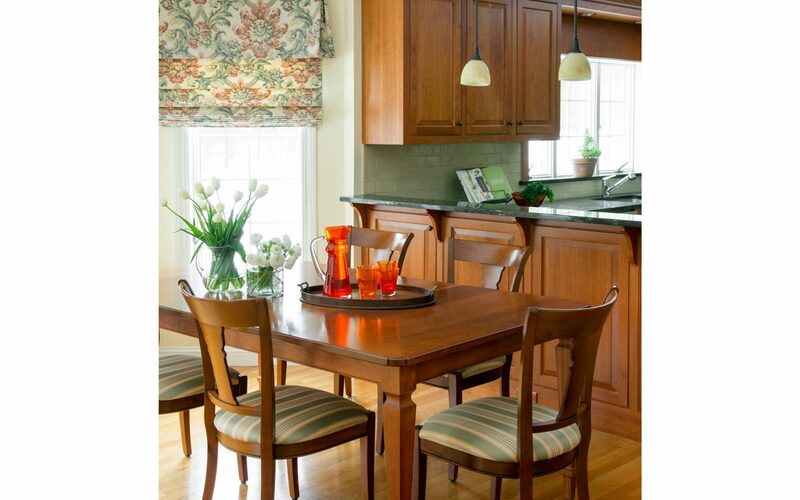 With a fresh kitchen design in place, we continued the transformation by next focusing on the breakfast nook. The breakfast nook is located adjacent to the kitchen. It is a casual gathering area in this house where the homeowners frequent for both meals and informal work. Prior to the kitchen renovation, the sun-filled nook opened directly into the kitchen. While the homeowners liked the openness, the kitchen and nook had no visual separation. Our solution was to add a peninsula to create a division between the breakfast nook and kitchen. This divided the space, somewhat, yet kept it open for light and communication. Besides adding a visual separation, our peninsula design added storage and countertop space. Additionally, it provided the homeowners with a bar top for casual entertaining. 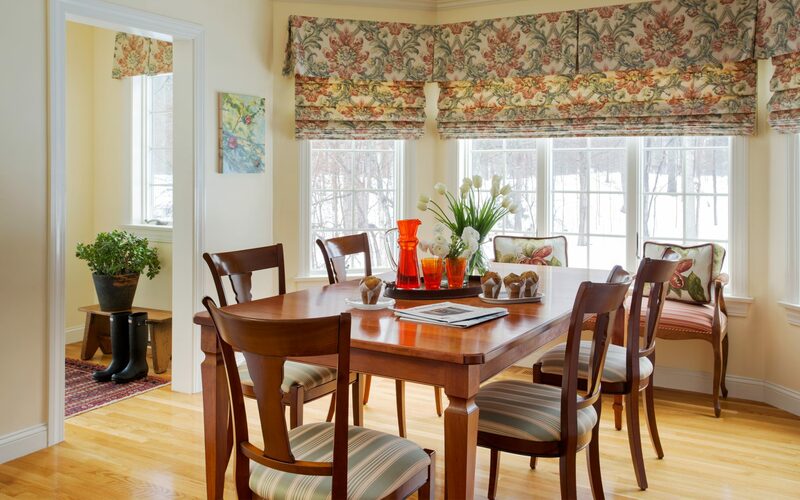 Elizabeth Swartz Interiors worked closely with a local craftsman detailing a custom dining table in natural cherry to match the new cabinets and blend with the traditional style of the home. We finished the space with custom window treatments, allowing the homeowners to control the amount of light in their renovated kitchen and breakfast nook. The second floor of this colonial home features a master suite that includes a sitting room, bedroom, walk-thru closet and bathroom. 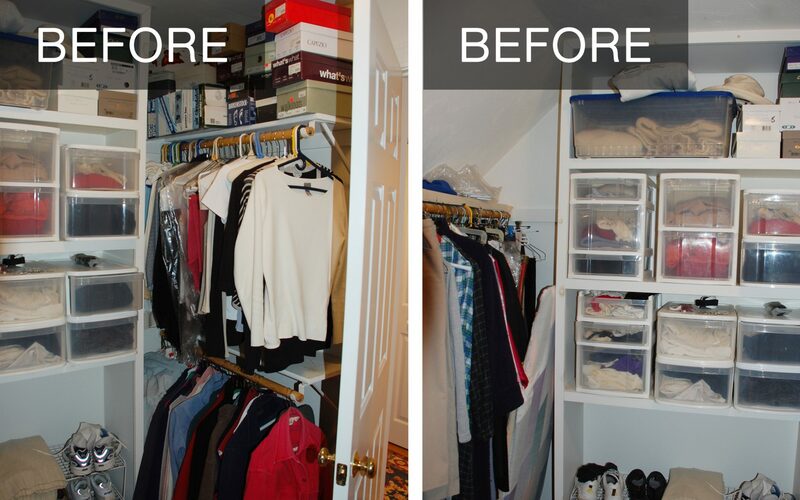 Before our remodel, the closet and bathroom were divided into several smaller rooms with odd proportions, wasted space and inefficient storage. 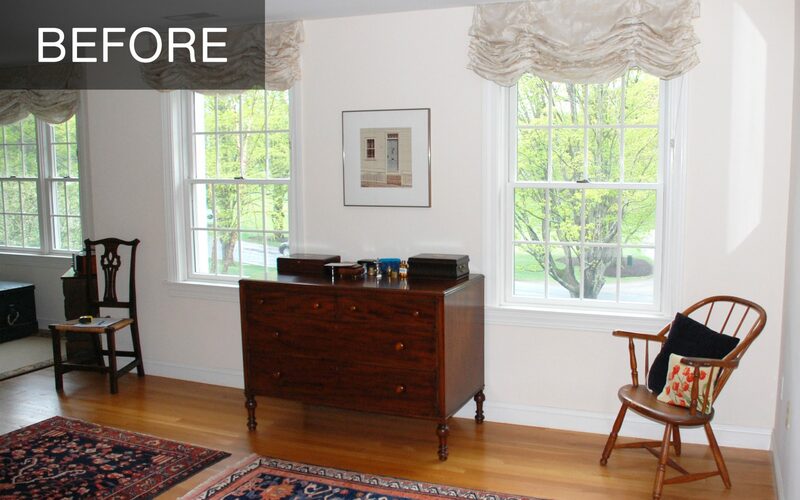 In the master bedroom the homeowners wanted to keep their beautiful antique furniture, yet modernize the space to reflect the renovations in the rest of their home. 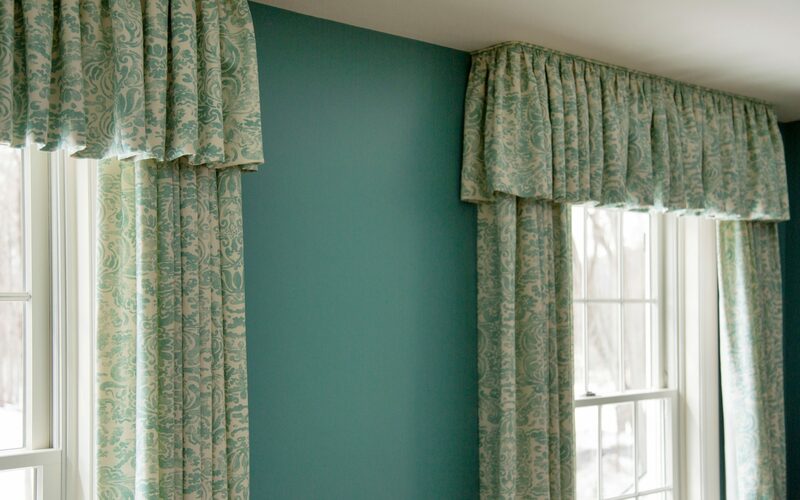 By adding details such updated colors and custom window treatments we were able to refresh the master bedroom while keeping with the traditional interior design the homeowners loved. The original master bedroom closets felt like an afterthought, crammed against the edge of the roofline with little built-in storage. Our solution was to re-design the roofline to incorporate a shed dormer. This extended the ceiling height and added windows to allow for natural light. 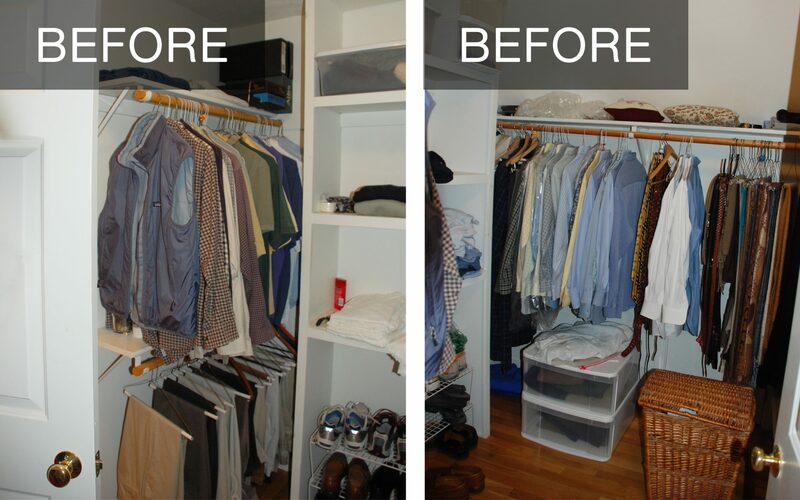 As a result the useable square footage in both the closet and master bath increased. The newly designed walk-thru closet now connects the master bedroom and bathroom. 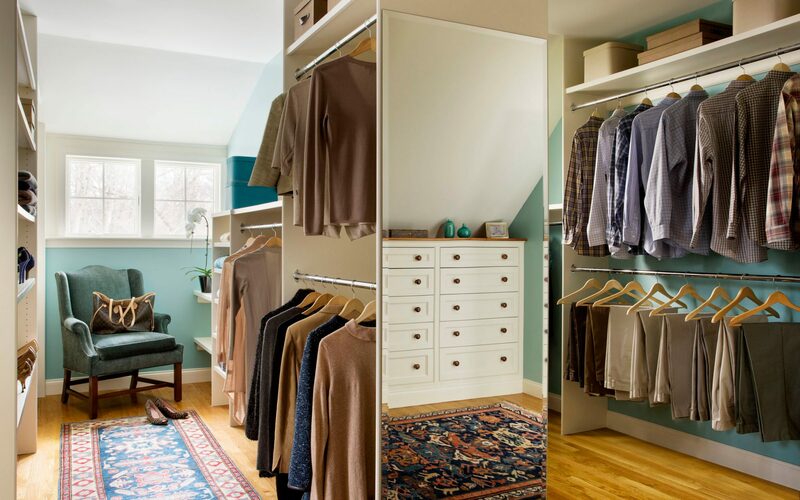 After the new plan was in place, we designed custom built-ins for a his-and-hers walk-in closet. Then we added ample task lighting in this previously dark closet. The outcome is an open and airy dressing area that makes daily tasks much more enjoyable. 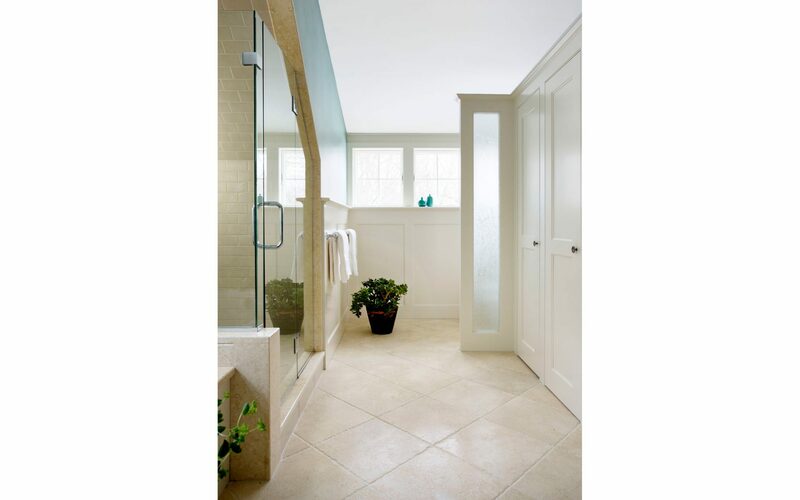 The original master bathroom was divided into a myriad of small and poor functioning rooms with little natural light. The vanity was located in a separate room from the shower, tub and toilet. The toilet area felt dark and small. 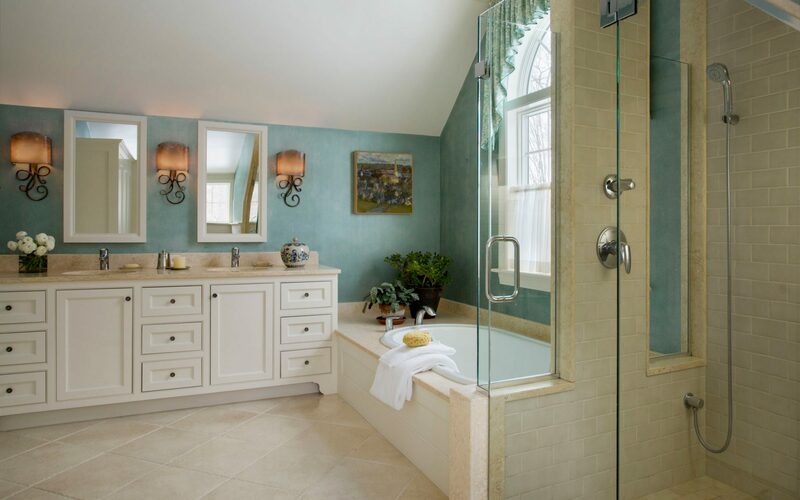 With the addition of the shed dormer Elizabeth Swartz Interiors re-designed the floor plan of the master bathroom. This included relocating the shower behind the large soaking bathtub. 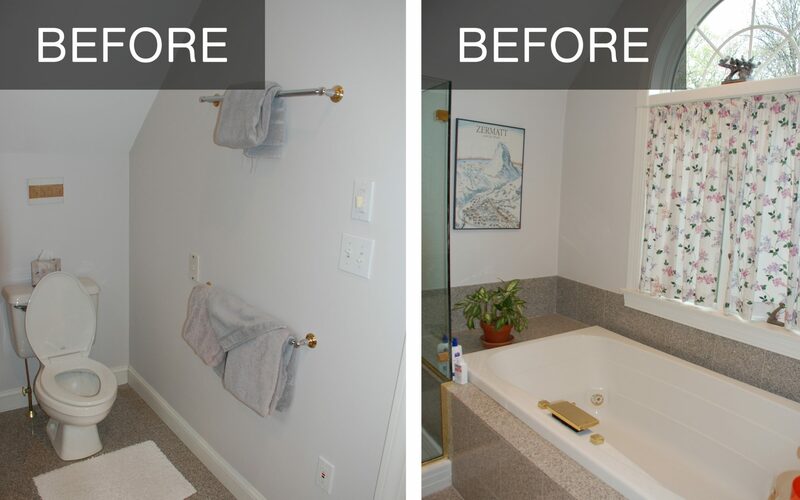 For this renovated bathroom we designed a custom built-in his-and-hers vanity against the long side of the bathroom. 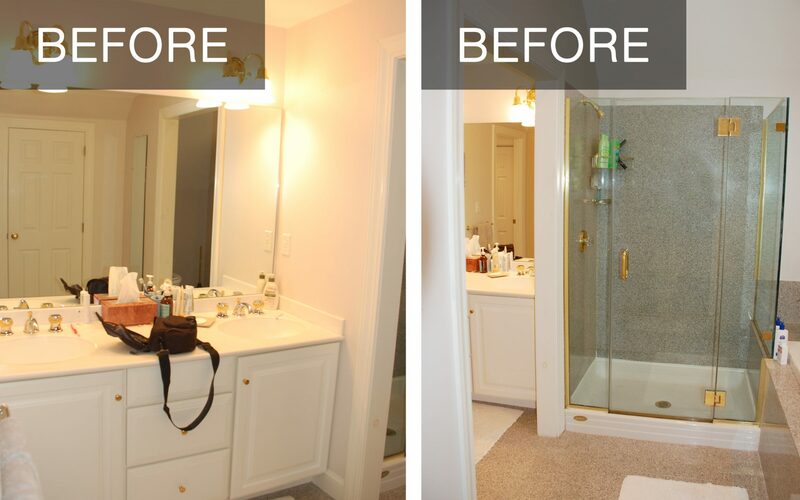 This bathroom vanity increased storage and gave this busy couple ample space for getting ready together. Opposite the glass wall shower we added a wall of closets for additional storage. At the end of the closets we located a frosted glass panel as a private nook for the toilet. With the interior renovations of this home almost complete, the homeowners turned to Elizabeth Swartz Interiors for help with updating the exterior. 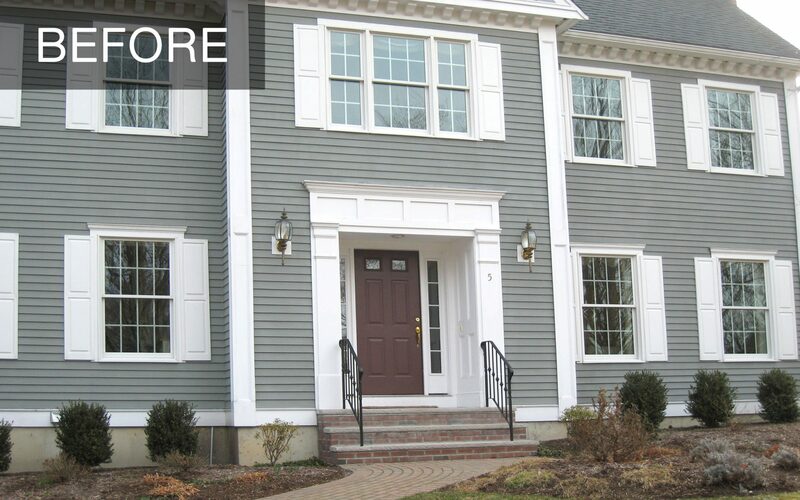 The homeowners wanted to modernize the facade while maintaining the home’s colonial presence. This home, built in outskirts of Boston, had a traditional colonial façade. Many of the exterior details were not the proper scale for the house. We worked closely with the builder specifying architectural details to update the exterior of this home. Our exterior renovation included the elimination of the dominant dental molding, replacing it with softer architectural details; a new custom entry door and surround, new lighting fixtures and an updated color palette. 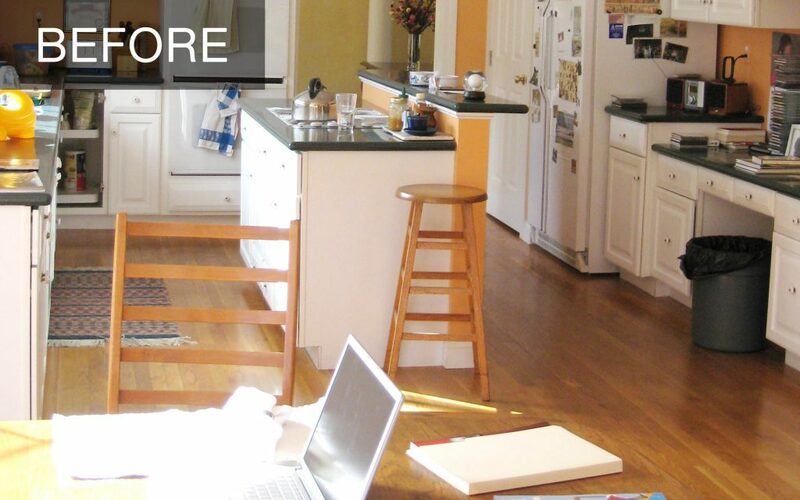 Are you ready to renovate your outdated kitchen, bath or entire home? Please contact us to get started today. Looks awesome! What great style, design and color usage! Congratulations Elizabeth. Thanks for sharing your insights! You perfectly honored the traditional architecture while giving the home a refreshing update, which is why we featured this on the Studio Designer’s Facebook and Twitter, as we so frequently do your blogs, as you are such a great writer.